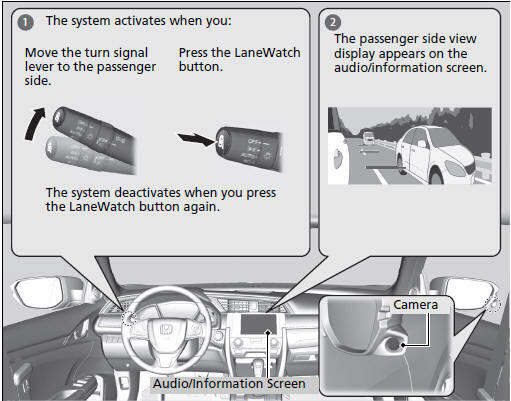 LaneWatch is an assistance system that allows you to check the passenger side rear areas displayed on the audio/information screen when the turn signal is activated to the passenger's side. A camera in the passenger side door mirror monitors these areas and allows you to check for vehicles, in addition to your visual check and use of the passenger door mirror. You can also keep the system on for your convenience while driving. WARNING Failure to visually confirm that it is safe to change lanes before doing so may result in a crash and serious injury or death. Do not rely only on LaneWatch while driving. Always look in your mirrors, to either side of your vehicle, and behind you for other vehicles before changing lanes. Important Safety Reminder Like all assistance systems, LaneWatch has limitations. Over reliance on LaneWatch may result in a collision. The LaneWatch function can be affected by weather, lighting (including headlights and low sun angle), ambient darkness, camera condition, and loading. Your vehicle's suspension has been altered, changing the height of the vehicle. Your tires are over or under inflated. Your tires or wheels are of varied size or construction. You can customize the following items using the audio/information screen. Show with Turn Signal: Selects whether LaneWatch monitor comes on when you operate the turn signal light lever. Display Time after Turn Signal Off: Changes the length of time the LaneWatch display stays on after you pull the turn signal lever back. Reference Lines: Selects whether the reference lines appear on the LaneWatch monitor. Display: Allows for display adjustments of items, such as brightness, contrast and black level. This setting is part of the System setup group. The LaneWatch camera view is restricted. Its unique lens makes objects on the screen look slightly different from what they are. LaneWatch display does not come on when the shift lever is in R.
The camera is located in the passenger side door mirror. Always keep this area clean. If the camera lens is covered with dirt or moisture, use a soft, moist cloth to keep the lens clean and free of debris. Do not cover the camera lens with labels or stickers of any kind. Do not touch the camera lens. Three lines that appear on the screen can give an idea of how far the vehicles or objects on the screen are from your vehicle, respectively. If an object is near line 1 (in red), it indicates that it is close to your vehicle whereas an object near line 3 farther away. The area around the reference line 1 (red) is very close to your vehicle. 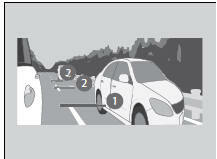 As always, make sure to visually confirm the safety of a lane change before changing lanes. The distance between your vehicle and lines 1, 2 and 3 on the screen vary depending on road conditions and vehicle loading. For example, the reference lines on the screen may seem to appear closer than the actual distances when the rear of your vehicle is more heavily loaded. The passenger side door mirror, or area around it is severely impacted, resulting in changing the camera angle. The LaneWatch display does not come on at all.